This is the “Evolution” level of the Mercedes-Benz Driving Academy’s Festival of AMG program. CONVOYS don't come much more spectacular. More than 40 of the most muscular Mercedes you can muster, collectively worth about $10 million. Lining Phillip Island's pit lane are a bevy of AMG's finest - that's Mercedes-Benz's performance arm - including the SLK 55 AMG roadster, C63 AMG Edition 507 coupe, CLS 63 AMG Shooting Brake and the E63 AMG saloon. Yet this is no museum. Those here are able to sample these powerhouses in their natural habitat. 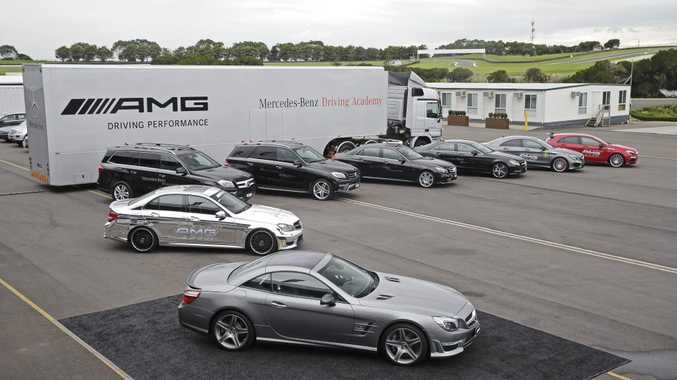 This is the "Evolution" level of the Mercedes-Benz Driving Academy's Festival of AMG program. It's one of about 120 events run by the academy, and while there are some days devoted to showing Benz customers the basics in car control and the latest technology, these AMG days are dedicated to quickening the pulse. There are events held in conjunction with the grand prix at Albert Park, one on the snow near Queenstown in New Zealand as well as another at Sydney Motorsport Park, and two at "The Island". Getting the opportunity to sample some of the three-pointed star's most brutal powerhouses is not open to just anyone. It's by invitation only, and there is never a shortage of drivers eager to put a selection of AMGs to the test. AMG event seats are prized, and the Phillip Island event was a rapid sell out with a willing group happy to lay down $2400 for the experience. Those on the illustrious invitation list are primarily AMG owners or members of the AMG club who have a proven ability on the track. And that circuit is fast and challenging. Our experience was made even more interesting by a gloomy Victorian day. Standing water and constant rain delivered conditions to test even the most experienced steerers. Phillip Island is not a place for the fainthearted. The MotoGP boys hammer past 320kmh on the main straight, but the AMGs usually pull close to 200kmh…although not in the wet. These are super difficult conditions. While we have donned race helmets for the experience, it's not a time for bravado. Mercedes-Benz Driving Academy chief Peter Hackett says it's time for restrained adrenalin and constant use of stability control. Hackett knows his stuff…and so does his team of instructors. Hackett comes from a strong background in motorsport and is most at home on the racetrack. He was the first driver to win both an Australian Formula 3 and Formula 4000 Championship and has also been a test driver for the A1GP Australia Team. His academy team boasts nearly 50 racing championships. They sit alongside the participants and provide timely advice and guidance on how to pilot these AMG brutes. And those instructions are vital when there's so much power directed to the back wheels. Braking in straight lines and with careful manipulation of the throttle you can still get around Phillip Island at a reasonable speed - even with the rain hammering down. Get on the right pedal with too much vigour and you can feel the rear end wiggle and see the yellow stability control warning light up in teh dash, which helps keep the AMG on the straight and narrow. It's all an unforgettable lesson in car control. Mercedes-Benz doesn't run these events for profit. It's about teaching its customers how to use the factory-tuned weaponry they drive daily. Lessons learned on the track translate into skills which provide driving confidence but also help survive tricky situations in traffic and the open road. Whether that be in torrential rain, avoiding someone running a red light or dodging wildlife. If more drivers undertook similar training, our motoring world would be a much safer place.